A prostate cancer survivor, Andrew Young has been a champion for Winship and has supported its National Cancer Institute Cancer Center Support Grant application. 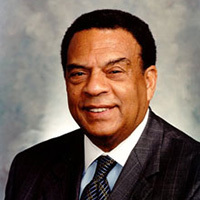 Andrew Young has worn a lot of hats during the past eight decades: U.S. Congressman, United Nations Ambassador, Mayor of Atlanta, leader of the Atlanta Olympic Games, Civil Rights activist, and cancer survivor. Young went public in 1999 with his diagnosis of early stage prostate cancer to help raise awareness about the disease, especially among African-American men. He was successfully treated at Winship Cancer Institute. Since that time, Young has been a champion for Winship and has supported its National Cancer Institute (NCI) Cancer Center Support Grant application. "Ambassador Young, as a cancer survivor who was treated at Winship, has helped us along our path to becoming an NCI-designated Comprehensive Cancer Center," says Walter J. Curran, Jr., MD, executive director of Winship. "Like those of us at Winship, he is committed to the effort of lessening the cancer burden in the state and providing cancer care to all Atlantans and all Georgians." Thumbnail photo courtesy of the National Council of Churches. 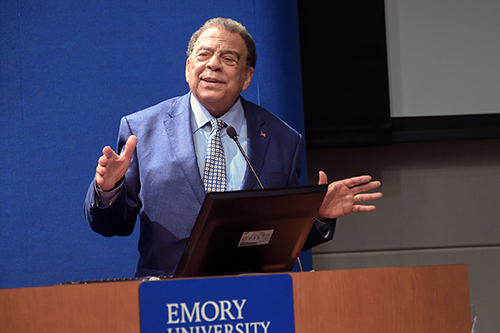 Andrew Young, a friend of Martin Luther King Jr., spoke to a capacity crowd at Emory University Hospital Midtown earlier this year on MLK Day.